Desk.com is an out-of-the-box customer support helpdesk platform. It helps small businesses hit the ground running and provide excellent customer service. It routes all customer support tickets from any source (email, live chat, phone, social media, etc.) into one single feed. Desk.com synchronizes several channels and is available on multiple platforms as well (mobile or desktop). Cases are organized into one feed, the internal ticketing system. Hence, agents can claim support tickets, update them, and follow up at any point of their lifecycle. Managers can also prioritize, leave notes, assign tasks, and coordinate their team’s effort. Therefore, Desk.com helps you automate workflow, increase productivity, and make informed decisions. Desk also enables customer health monitoring, using data analytics to predict customer behavior and satisfaction. It empowers customers with easy access to tutorials and other didactic resources. Desk.com’s features are already extensive on its own, but it also enables many useful integrations to further boost productivity, facilitate customer support, and grow your business. Desk.com can boast a large number of great integrations. Here’s a look at those we found the most useful. Salesforce’s Customer Relationship Management system is a lifesaver for uncountable businesses. It handles the progression of the entire customer life cycle, and aggregates all the information relevant for sales and support teams alike. Integration: The two-way integration of Salesforce and desk.com provides a complete and thorough overview of every customer interaction over time. Desk.com users can pull up account information from Salesforce while working on support tickets and cases. Salesforce users can see the details of past customer support when accessing a customer’s file. The interaction between the two platforms is perfectly complementary, greatly facilitating the articulation of support and sales. Slack synchronizes all of your team’s communications in one place. Your exchanges are grouped by relevant channels or happen in private conversations. Chat logs, documents, and decisions are archived and accessible from anywhere. Your team can communicate seamlessly and in real-time, fostering cooperation and efficiency. Integration: Coupled with desk.com, Slack allows you update cases and tickets in real time, with every new development. A simple link allows you to view the details in either interface. Consequently, Slack and Desk.com let your whole team stay on the same page, and provide an expeditious resolution to every customer support situation. Mailchimp is a platform to create email campaigns and share them on social media. It’s like a personal publishing platform, allowing users to easily monitor how well their campaigns and newsletters perform with their destined audience. Integration: Used in conjunction with desk.com, Mailchimp can import your contacts, lists, and customer segments and sync them to your tickets and cases. Should you want to send promotional information to a specific demographic, Mailchimp and desk.com have got you covered. This allows agents to flag customer demographics for targeted content, thus guaranteeing greater involvement. The data collected and saved in desk.com will let you work towards more effective email campaigns. Aircall is a VOIP business phone system. Aircall’s intuitive dashboard allows you to easily handle the flow of calls while working as a team. With phone numbers available in 40 different countries, a real potential for scalability, and a host of features, Aircall makes your business phone system a real asset for both sales and support teams. Integration: When integrated with Aircall, Desk.com can import your contact list, and distribute calls amongst your team. For every inbound call, outbound call, or voicemail placed through the Aircall widget, Desk.com will keep your support tickets updated. When a call comes in from a client, Aircall will help you take the call and Desk.com will display the client’s information. Your feed will be kept up to date with relevant and informative data such as call logs and voice mails, so your support team can stay on top of every customer interaction. Additionally, all of the advantages of the Desk.com/Aircall integration are available on any device, from anywhere. GetFeedback is a survey software application. Collecting customer feedback can yield valuable insight into your customer’s habits and needs; GetFeedback lets you quickly craft mobile-ready, visually appealing surveys for your brand. Integration: GetFeedback integrates with Desk.com and Salesforce to enable both sales and support teams to benefit from customer feedback. The integration lets you embed surveys into your support center, your emails, and your website. This gives customers every opportunity to get in touch. GetFeedback then syncs this data directly to the relevant cases in your internal Desk.com feed. This data is also sent to Salesforce’s Sales Cloud to give you a comprehensive view of your customers’ experience across sales and support. Inbenta uses artificial intelligence to optimize your self-service knowledge bases. This offers your customers immediate access to the FAQ or tutorial they need, thereby decreasing your support team’s workload and your customers’ waiting time. Easy access to knowledge bases favors onboarding, product adoption, and everyday support. By favoring efficient self-service support, you can minimize the number of customers who call with a support issue. Integration: Inbenta is a snap to integrate with Desk.com. You will be able to link content to tickets, and to follow user analytics in real time to determine how to improve your knowledge base for your customers. 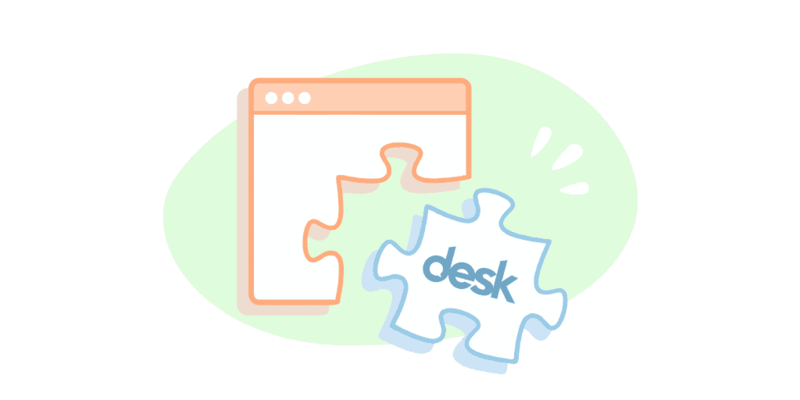 Zapier allows you to easily connect Desk.com and over 500 other applications and freely transfer information between them. You can also automate repetitive tasks to free up your team’s time to better serve your customers. Integration: With Zapier, you can link the data gathered, monitored, and analyzed in any of the recognized applications to your case tickets. With every customer interaction, your agents will have a wealth of knowledge at their immediate disposal. Totango is a platform which aims to “simplify the complexities of customer success”. This service gathers data and helps you analyze which areas of the customer experience need your attention. This data-driven method drives customer success and boosts product adoption, thereby reducing churn. Integration: Once intergrated to desk.com, Totango monitors customer behavior and usage, and cross-references this data with your CRM system. So, your tickets and customer cases are updated with insight on customer health. This turns customer incidents into opportunities for growth, brings to light actionable ways to improve customer success, and makes your service an integral part of that success. Olark is a live chat feature for your website, with a strong focus on customer success. With this in mind, Olark’s seeks to help you understand what your customers expect from your services when they are browsing your website. Besides that, the service is highly customizable, and aims to empower your customers’ success by giving them personalized service. Integration: In conjunction with desk.com, Olark saves every instance of customer interaction over live chat, as well as additional information about website use. This data is cross-referenced with your cases. This way, you can offer your customers real-time, highly personalized support, making sure that no customer falls through the tracks. Cyfe is a cloud-based data analytics service. Collecting, monitoring, analyzing, and reporting data is an incredibly time-consuming activity; yet it is becoming increasingly indispensable. In order to expand, your company needs to use data analytics to monitor its performance. Concurrently, as your company grows, the amount of data to analyze increases. That’s where Cyfe comes in, to easily monitor and share your vital business data. Integration: With its Desk.com integration, the Cyfe dashboard shows your customer support data. You can select which metrics to track, and let Cyfe track your customer support performance in real-time. Now that you’ve seen how useful and worthwhile it can be to start using Desk.com integrations. Hence, here are some tips on how to get the most out of the process. First, before picking the right tools, you need to determine what your business aspirations are, and set goals accordingly. Desk.com and its integrations can improve many different areas of your business, but you need to have clear objectives in order to get the most out of your tools. Do you want to improve your support team’s reactivity and efficiency? Focus on enabling your customers’ success? Or monitor customer satisfaction more closely? Indeed, all these aspirations are valid, and can benefit from Desk.com and corresponding integrations. Making the right use of this solution depends on your product or service, your customer base, your resources, and so on. Then, given the sheer number of available Desk.com integrations, not all of them will apply usefully to your business. The ten we looked at in detail happen to be our favorites, but each company’s need is different. Indeed, once you know what you hope to get out of Desk.com, you can pick relevant integrations. Installing them is simple enough that you can try out what works best for you. Lastly, Desk.com’s help section is a testament to the quality of support its integrations can help you provide to your own customers. Therefore, should you need assistance on any topic, including integrations, they’ve got you covered. Every application has a step-by-step guide to integrating with Desk.com, and if the self-service content doesn’t cut it, you can always call up their support number. Desk.com’s support team can also help you with picking, adding, and configuring integrations to ensure you quickly get back to providing amazing service to your own customers.